Knitting during World War II: During World War II, civilians on the Home Front knitted scarves, hats, gloves, and socks for soldiers on the front. Everyone was encouraged to “Knit Your Bit” and donate warm knitted items to their local Red Cross stations. These knitted items helped keep American soldiers warm during the freezing European winters as well as reminded them of their home sweet home. 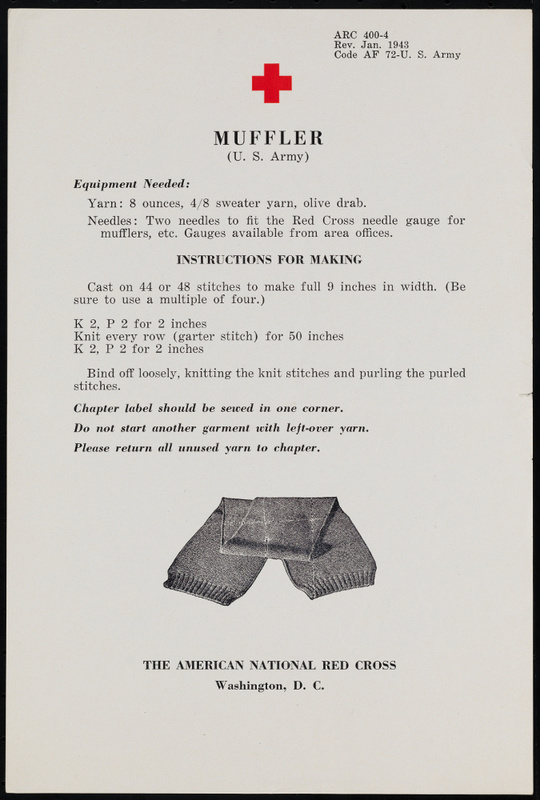 In 1943, the American Red Cross listed these instructions explaining how to knit a Muffler. Courtesy of the National Endownment for the Humanities. Knit Your Bit: The WWII knitting program has inspired the creation of the Museum’s Knit Your Bit program. In the past 10 years, the Museum has collected over 50,000 scarves to donate to veterans. If you would like to knit a scarf for a veteran or create a scarf in gender neutral colors and send it in to the National WWII Museum in New Orleans or to one of our community partners around the country follow this link. DIY Knitting Needles: Do you want to knit a scarf, but don’t have the needles? Are you looking for a creative way to engage your kids in knitting? You should try making your own needles because its simple, inexpensive, and a great hands on learning lesson for you or your kids. Step 1: Sharpen one end of each of your dowel rods using the pencil sharpener. They should be as sharp as a pencil when you are done with this step. Step 2: Sand your dowel rods. Use the sand paper to make the dowel rods as smooth as possible so that you won’t get any splinters in your hands or in your yarn while knitting. Make sure to sand the pointed end so that it is rounded rather than sharp. Step 3: Make the other end of the needle. Roll your clay into two balls. Push those balls onto the non-sharpened ends of your dowel rods. Mold the clay into whatever shape you desire but maintain a right angle between the dowel rod and the beginning of your clay. This will keep the yarn from falling of the needles. Step 4: Bake the needles. Set the oven for the temperature on your clay package. Allow it to fully pre-heat. Stick the needles on a baking sheet with foil underneath. Bake the needles for no more than 10 minutes. Watch the needles the entire time and be ready to pull them out the moment the wood begins to change color to avoid burning the wood. Step 5: Cool needles and re-sand if necessary. WWII propaganda calling on people to knit. Posted by Sara Scott, Public Programs Intern and Lauren Handley, Assistant Director of Education for Public Programs at The National WWII Museum.